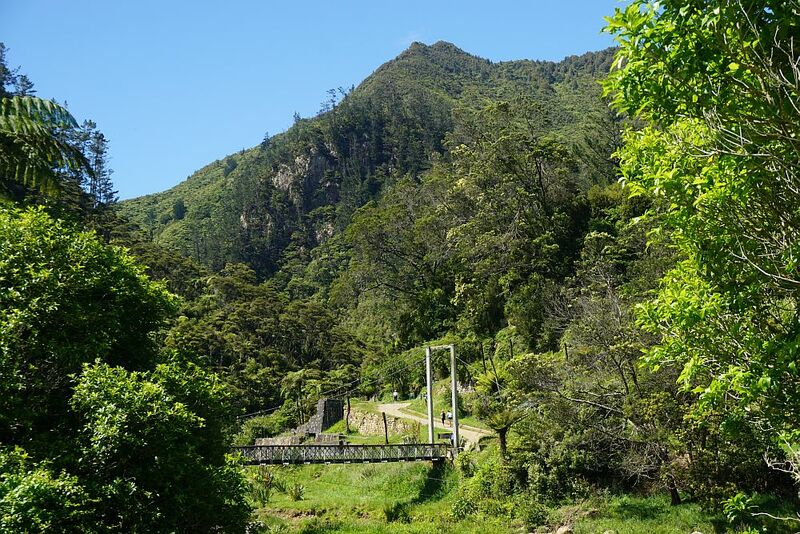 The DoC web site has information about the Karangahake Gorge, which is best known for gold mining, but apparently no specific mention of the tracks to the summit. 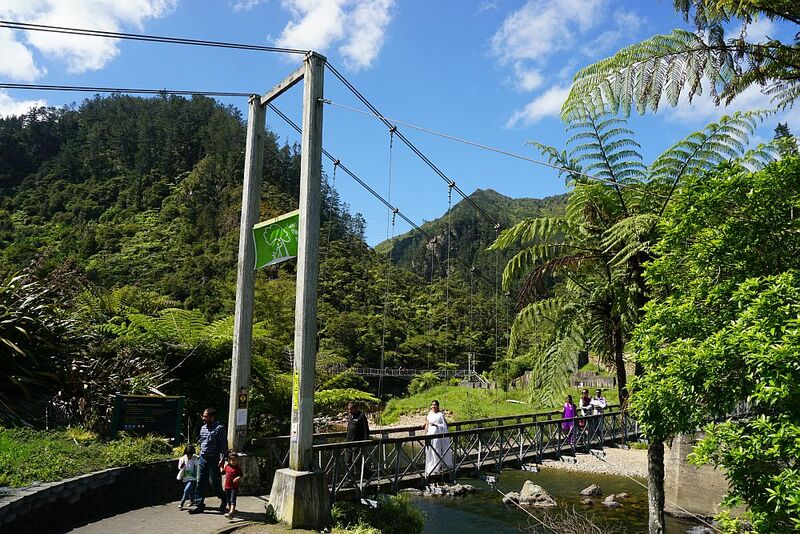 Today’s walk started at the main carpark off SH2, crossing over the Ohinemuri River on a swingbridge, taking Scotsman’s Gully track through bush to the Crown Hill Rd, following Crown Hill Rd for a short distance before turning off onto the Mountain Track. A short distance up the Mountain Track there is an unmarked but well-formed and well-used track taking a more direct and steeper route to the summit. This was the track used on the ascent. The downhill walk was on the longer Mountain Track, which was muddy and slippery in places, but not as steep as the direct track. The walk then continued down Crown Hill Rd and County Rd to the carpark, where it turned off along the cycleway/walkway back along the river to the swingbridge and the main carpark. A total distance of about 11km, taking a total of about 4 hours, including a lunch break at the trig station. 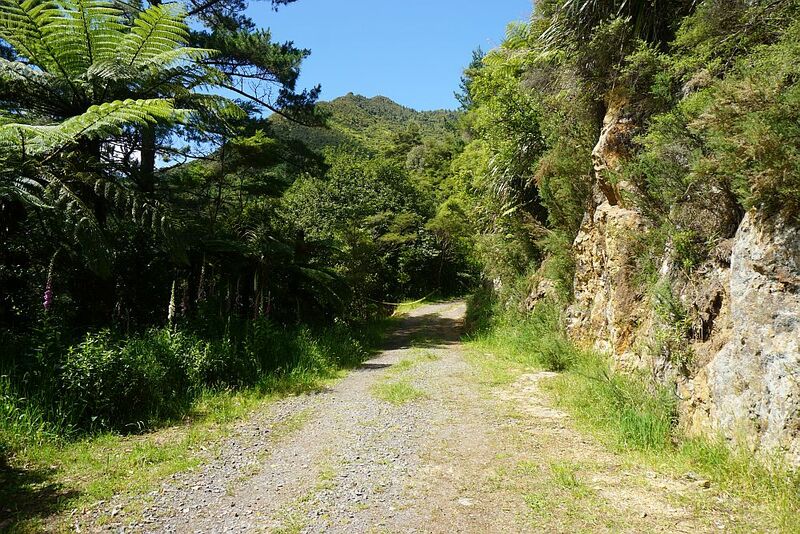 The carpark is only about 35m asl, so there is a total climb of over 500m to reach the trig station. 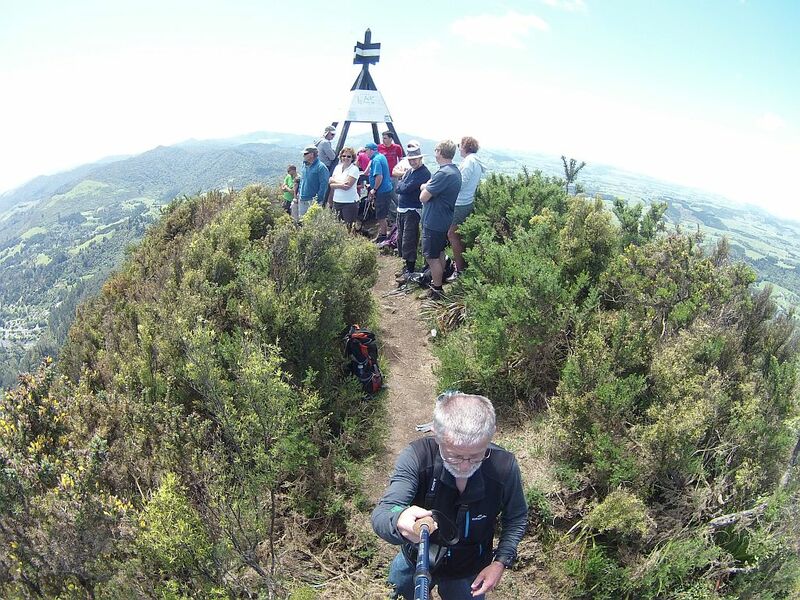 On previous occasions there have been no other walkers at or near the summit. 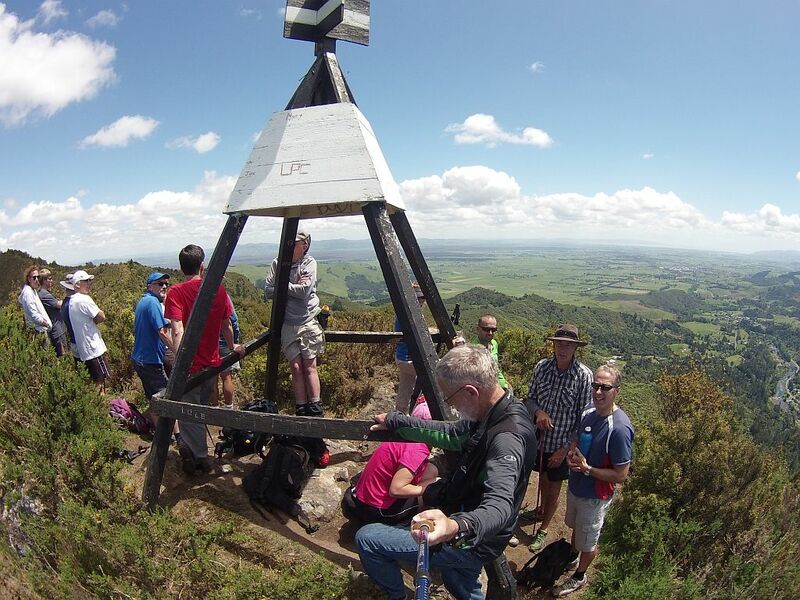 Today there was a group of about 20 people from the Active Tauranga meetup group enjoying a lunch break at the trig station. 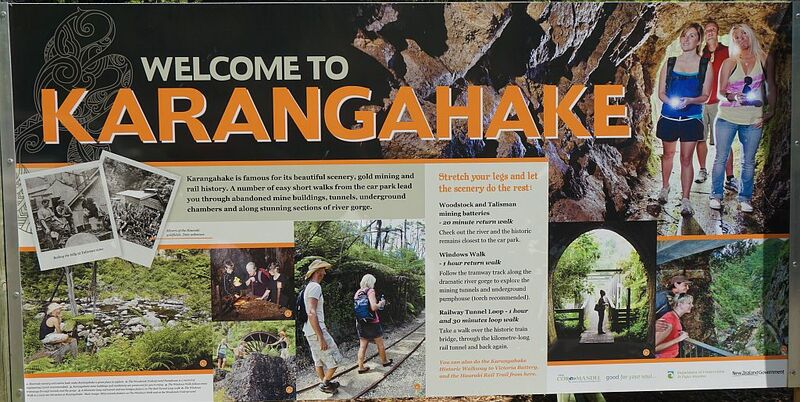 The history of gold mining in the area and on Mt Karangahake itself is interesting and well documented on information panels by the walkways. It will be covered in a future blog post. 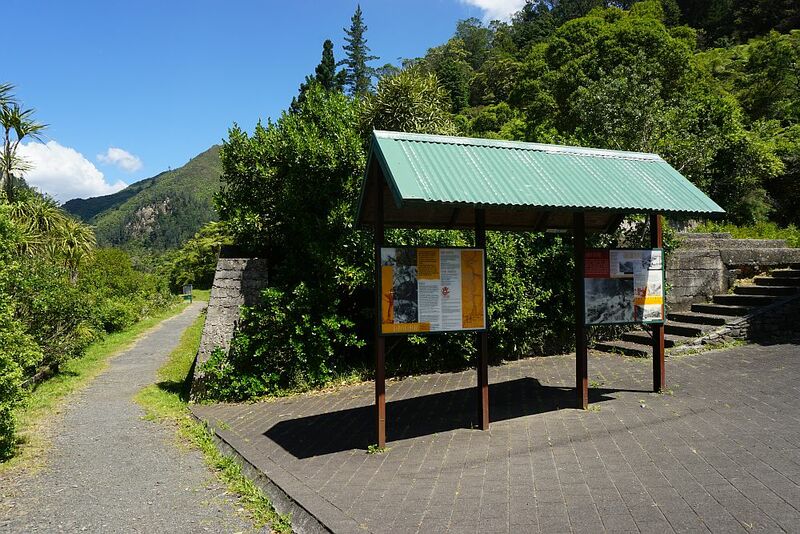 Information panels at the carpark and various locations alongside the tracks give an overview and extensive information about gold mining history and the geology of the area. The trig station is visible from the carpark. It’s on the rightmost of the two highest points above the swingbridge. 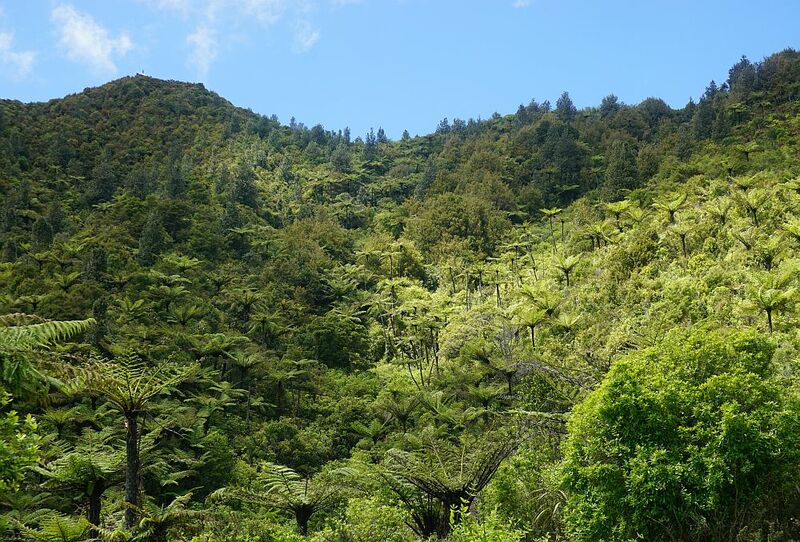 The walks in the gorge are popular with locals and visitors alike. 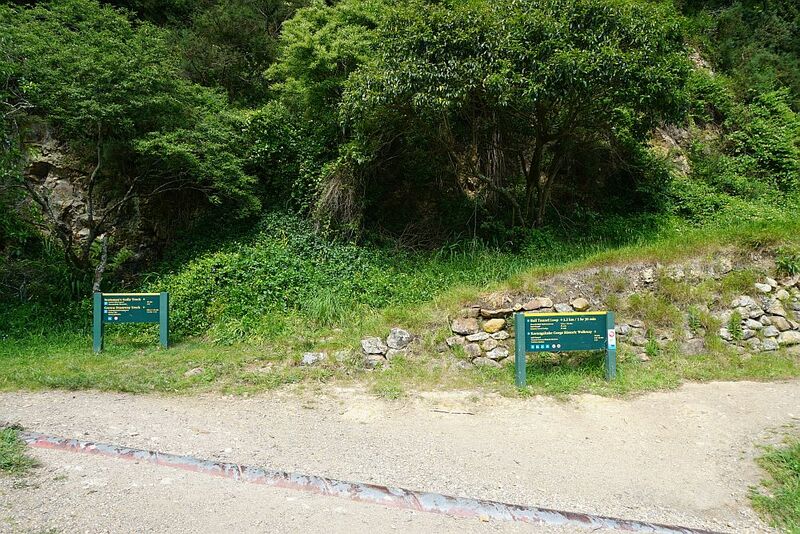 Scotsman’s Gully Track goes off to the right between the two signs. 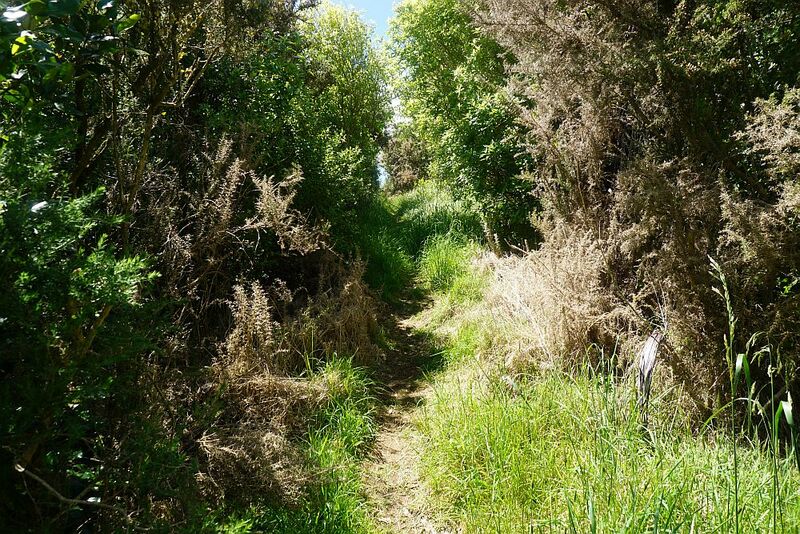 It’s a short but pleasant walk to Crown Hill Rd, with a stream crossing on the way. 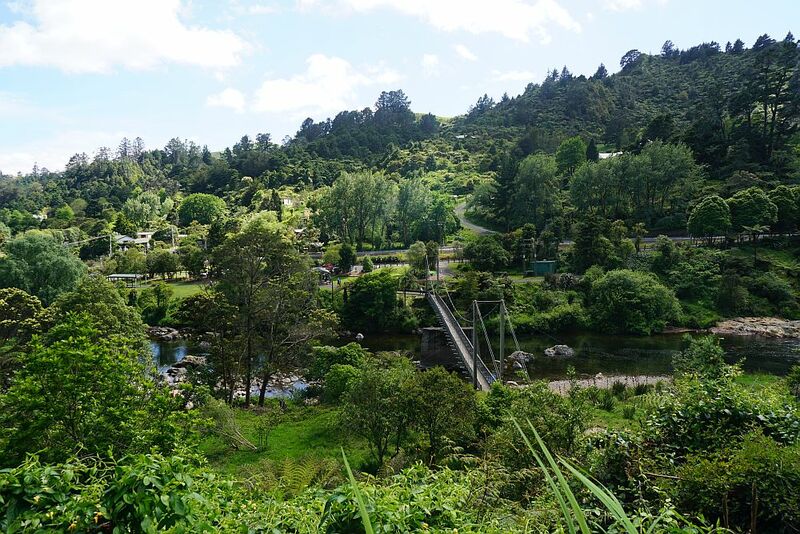 Looking back at the swingbridge and the carpark from near the start of Scotsman’s Gully Track. 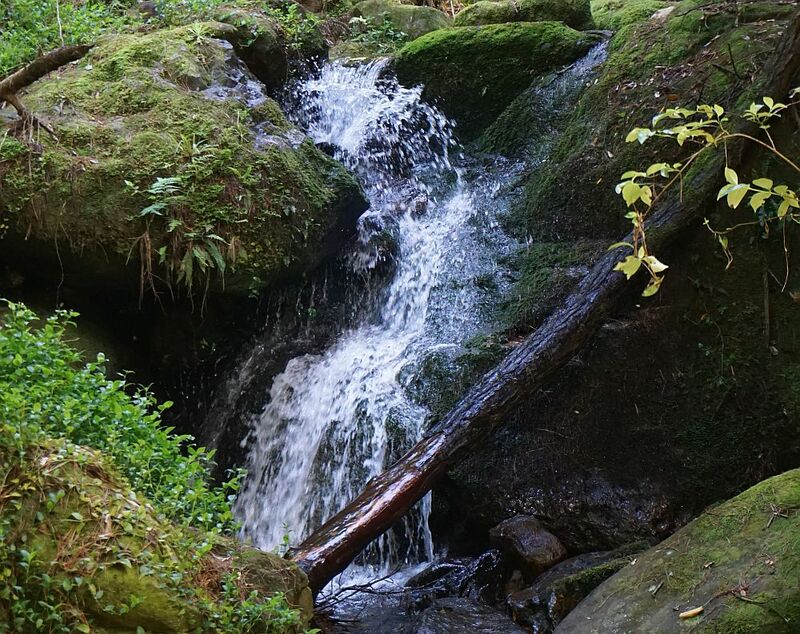 The stream has formed a small natural fountain as it drops onto rocks. It has been there for several years, despite slips and fallen trees nearby. 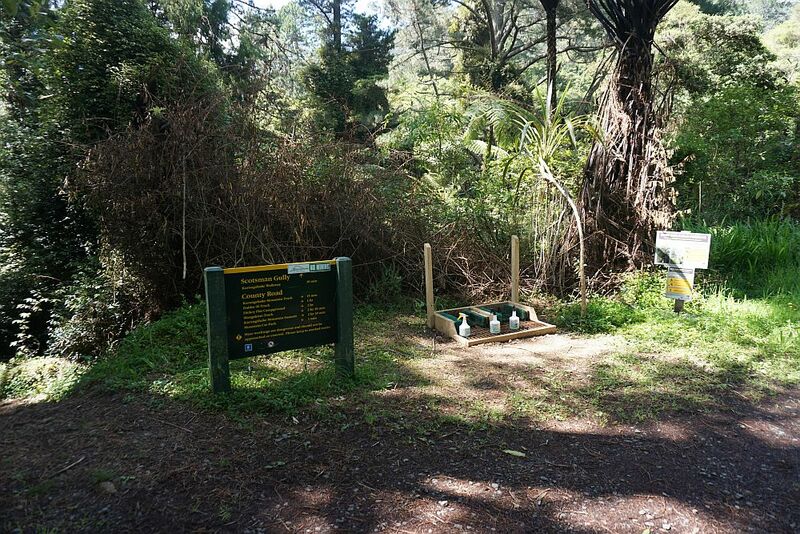 To avoid the spread of Kauri Dieback disease a cleaning station has been installed, with bottles of disinfectant for spraying underneath shoes and boots. The Mountain Track goes off Crown Hill Rd to the right behind the sign. The trig station is also visible from the turnoff to Mountain Track. 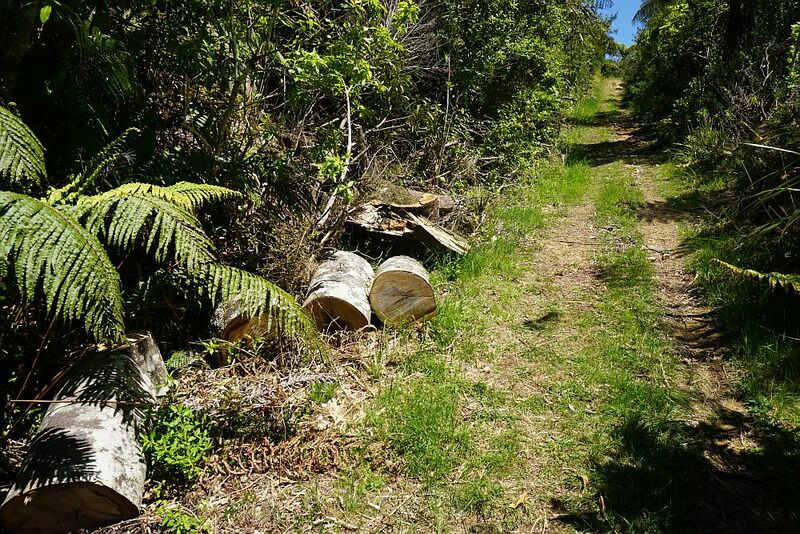 The unmarked direct track to the summit turns off to the left about 1km from the start of Mountain Track. It’s easy to walk past the track without seeing it. 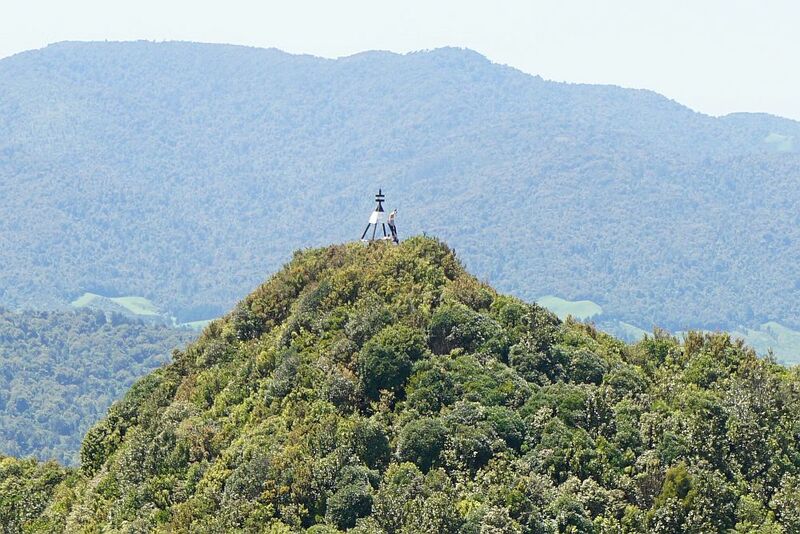 The summit is getting closer, and the trig station easier to see. 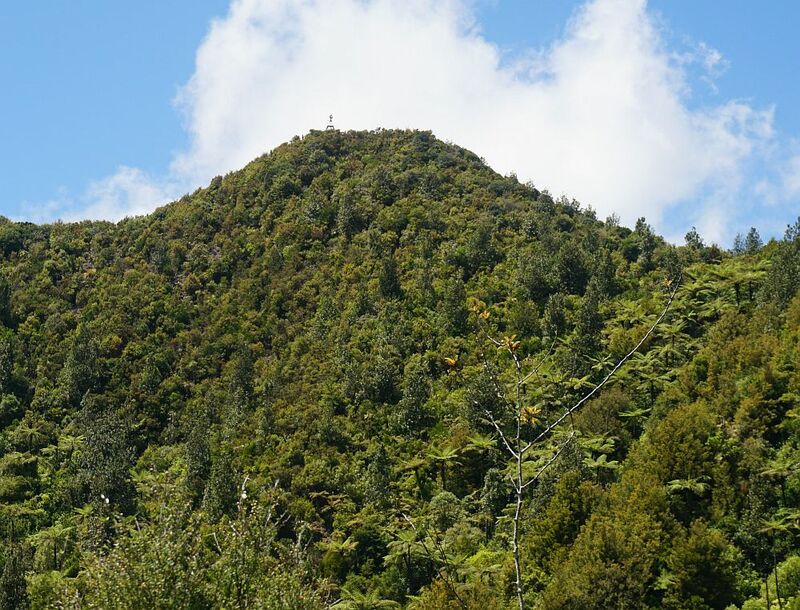 The trig station is on the peak to the left, the communication mast on the peak to the right, with the track emerging onto the summit ridge near the right hand peak. 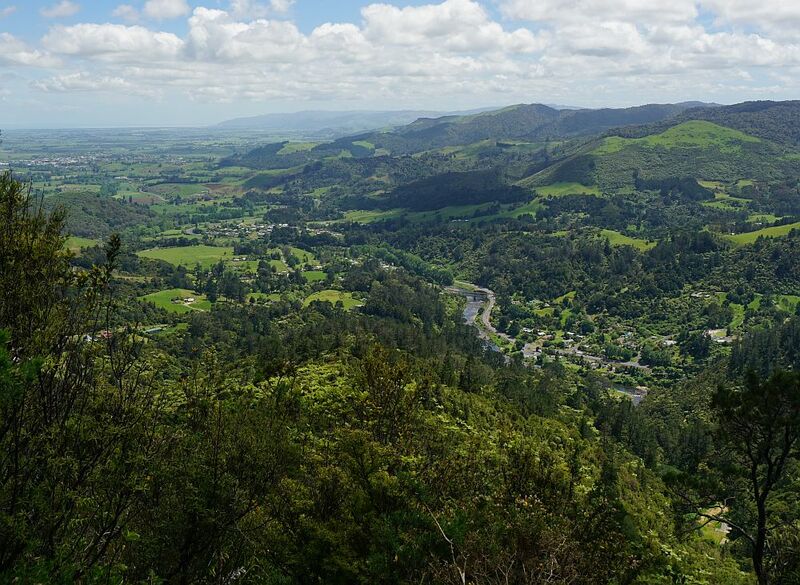 The carpark, SH2, Ohinemuri River and Paeroa (on the far left) are clearly visible from the direct track. Not much climbing left now before reaching the summit and trig station. 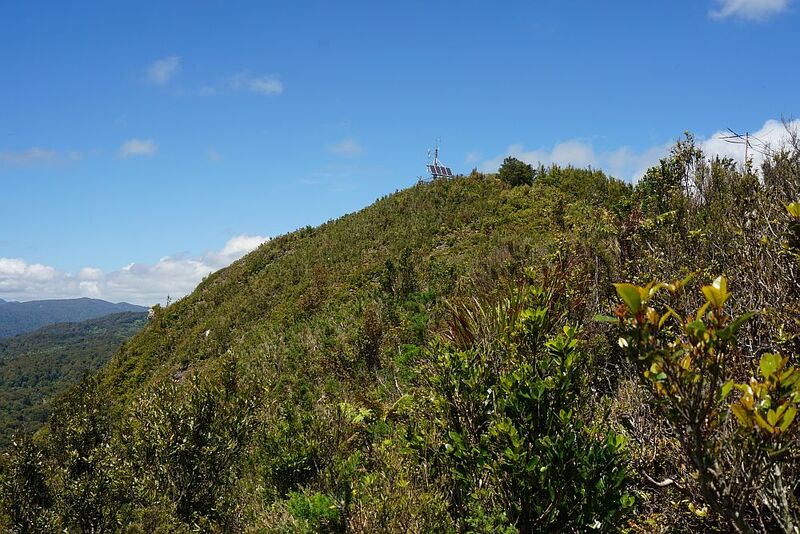 The communication mast with solar panels, seen from the junction of the direct track and the summit ridge track. The group enjoying their lunch break at the trig station. A few ‘selfies’ together with some of the group at the trig station. 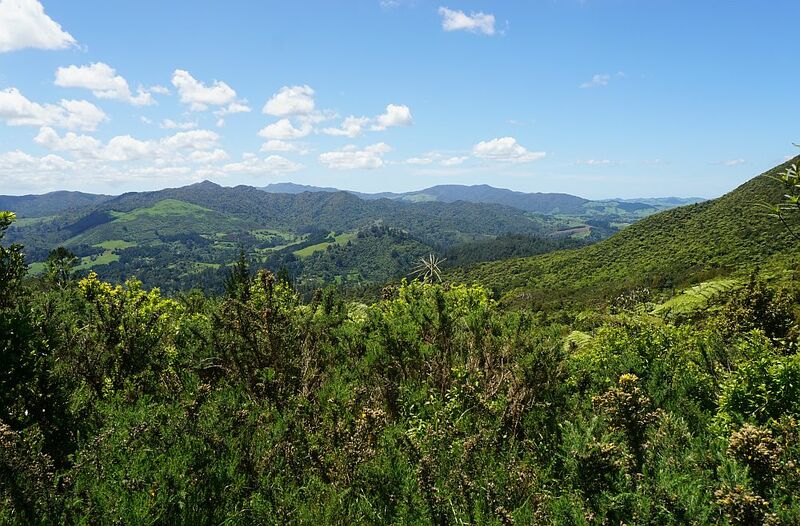 View from the trig station, looking towards Waihi. 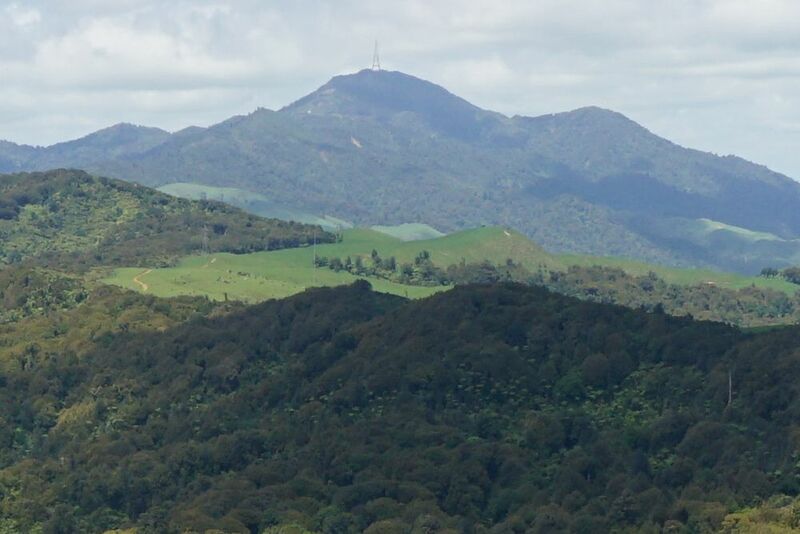 Mt Te Aroha, with the large mast on top, seen from the trig station. Looking back at the trig station from the communication mast. 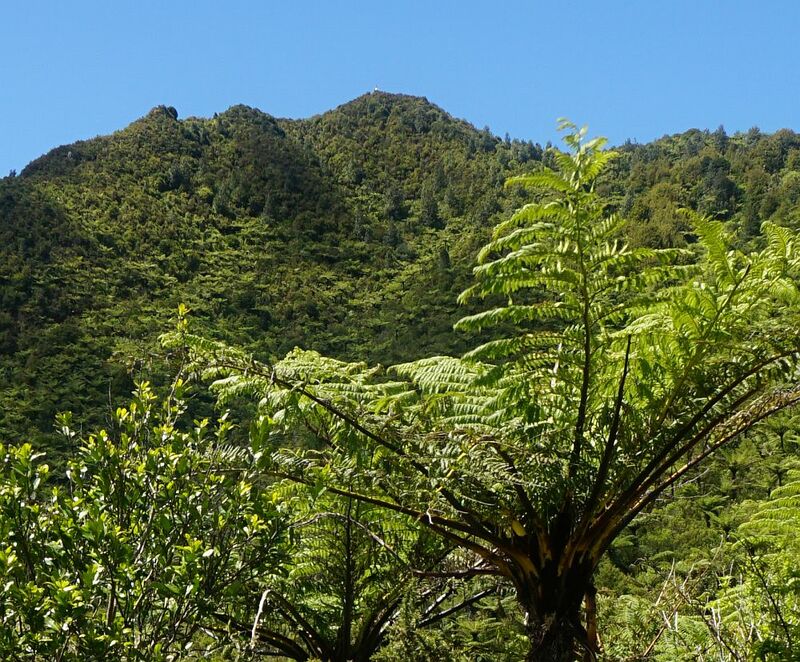 There is a lookout a few minutes walk from the mountain track, but unfortunately the vegetation has taken some of the best views. 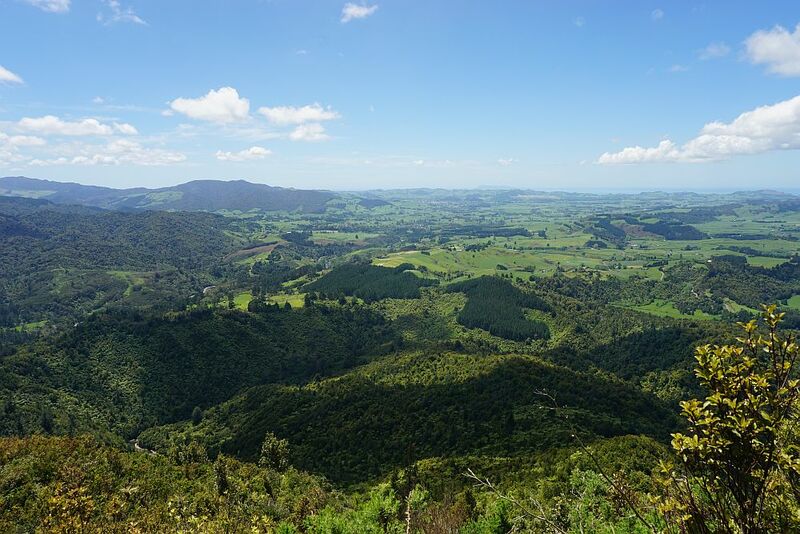 This view looking towards Waihi. A tree had recently fallen right across the track, but now cut up and left by the track. 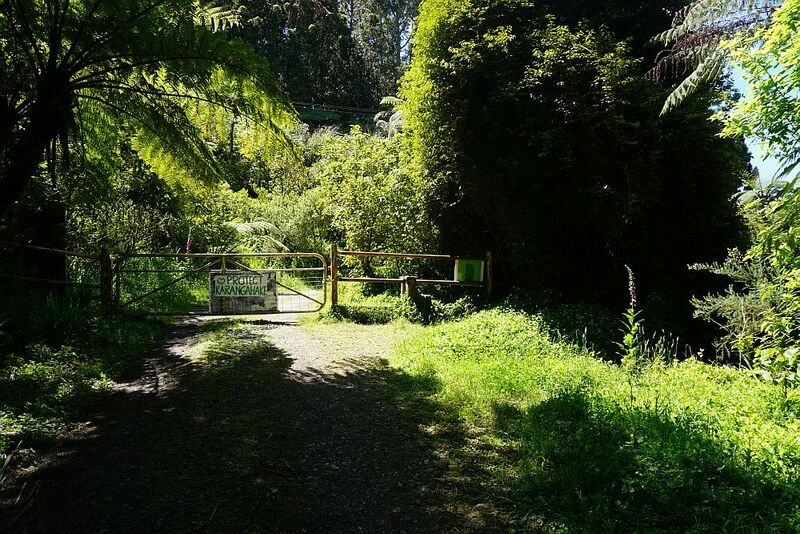 The locked gate on Crown Hill Rd, near the end of Scotsman’s Gully Track, and the parking area on Crown Hill Rd. 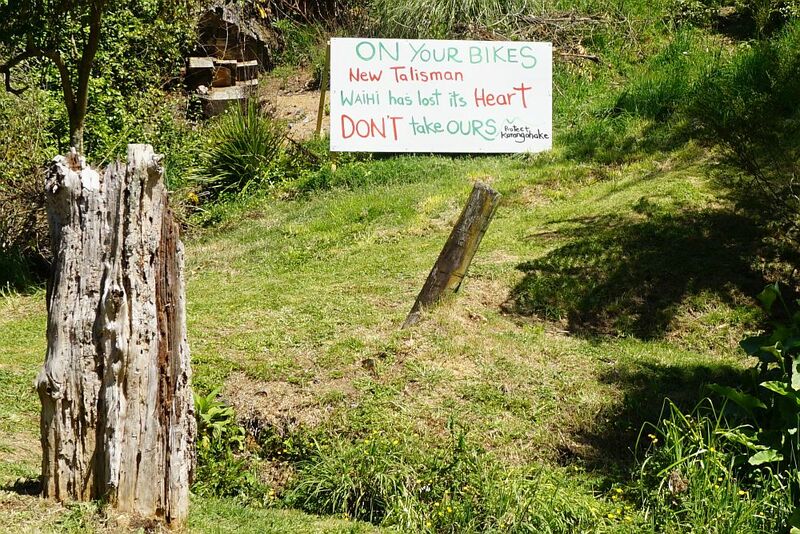 Recent mining activity by New Talisman in the gorge is not popular with many of the local residents. The track from the County Rd carpark along the river and back to the main carpark, with information panels. 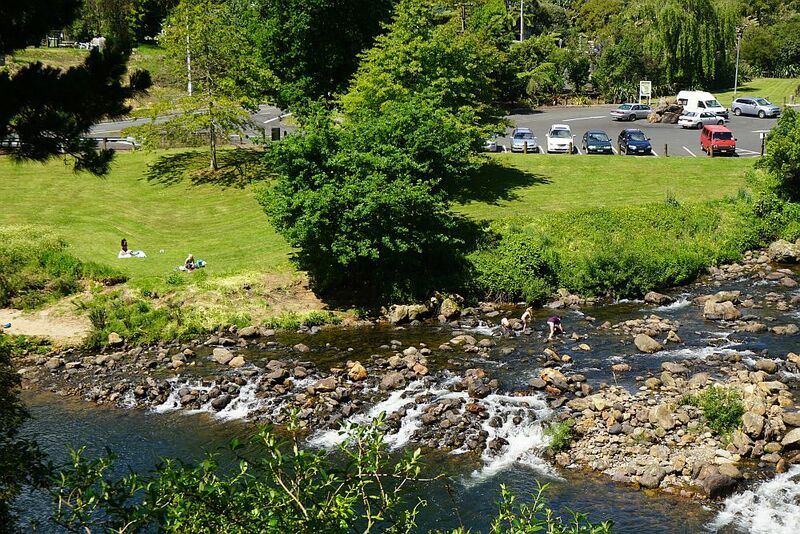 On a warm day the river and the picnic areas nearby are popular. Children were playing in the river. 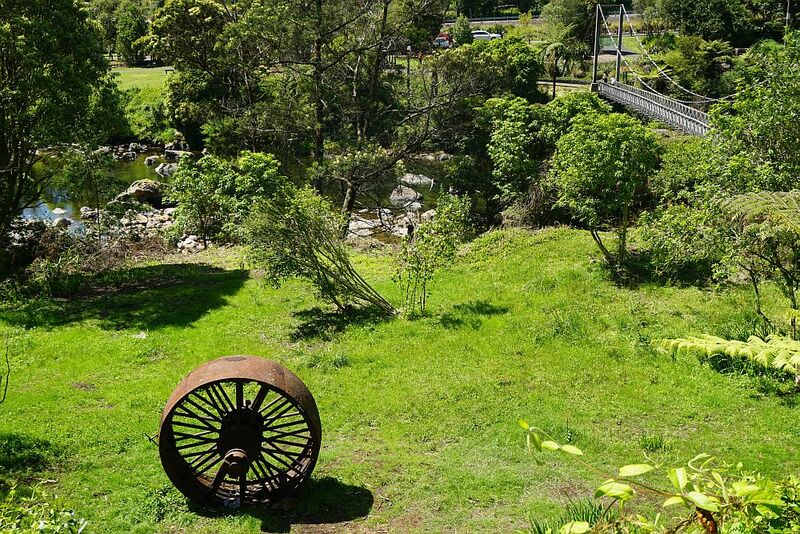 Back near the swingbridge with some of the machinery remnants from the gold mining days. 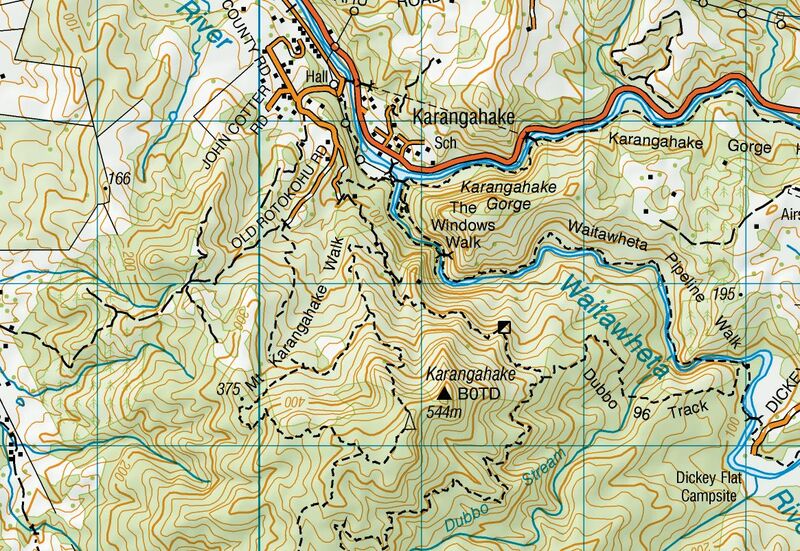 An excerpt of a topographic map covering the area walked. The trig station is marked as BOTD, with the height of 544m. The lookout is at the point marked 375 on the topo map. A GPS track log of the walk on November 8, 2014. The track to the trig station, jutting off to the right near the bottom of the log, is not shown on the topographic map. 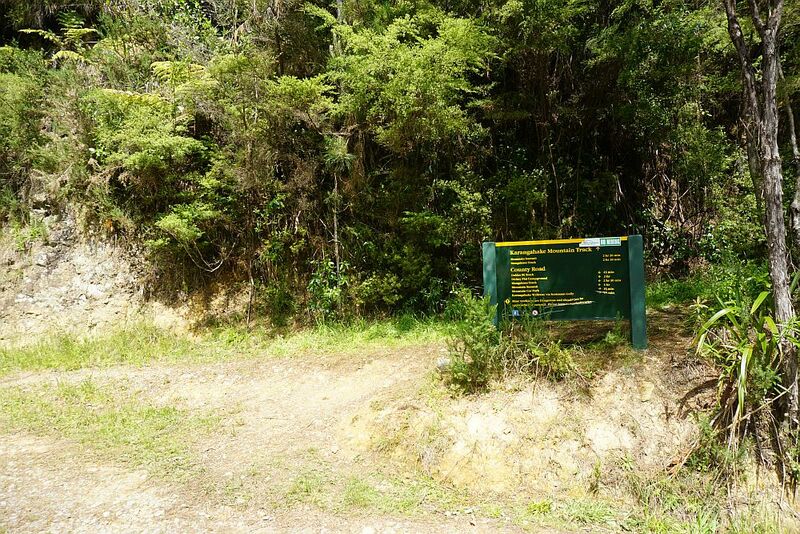 SH2 carpark to trig station, via Scotsman Gully to Crown Hill Rd, Mountain Track, and the direct unmarked track to the trig station took 1 hour 30 minutes for a distance of 3.5km. 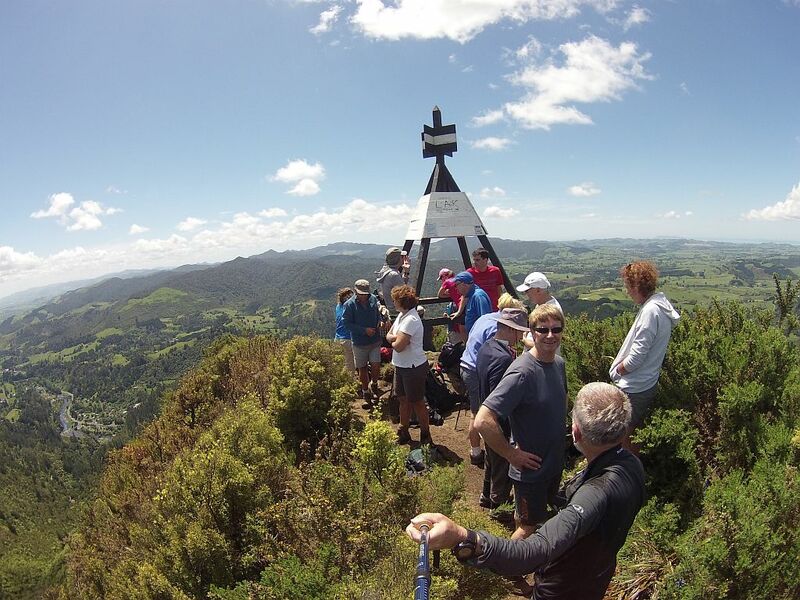 Trig station to SH2 carpark via communications station, Mountain Track, lookout, Crown Hill Rd and Scotsman Gully took 2 hours, for a distance of 5.6 km. Thank you, Vicky. Hope you enjoy(ed) your walk! Many thanks for your comments, Baz. I’m pleased you made it and also enjoyed it despite the adverse conditions. Some of us older youngsters do need to take care in selecting when and where to walk. 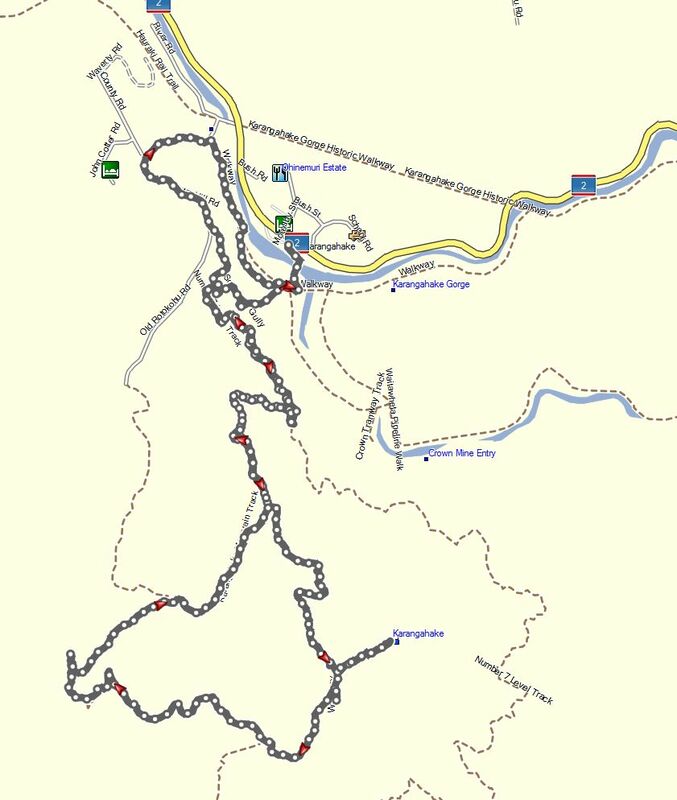 I always carry a PLB (personal locator beacon) when out walking, as many tracks are outside cellphone coverage and may not be in use every day. 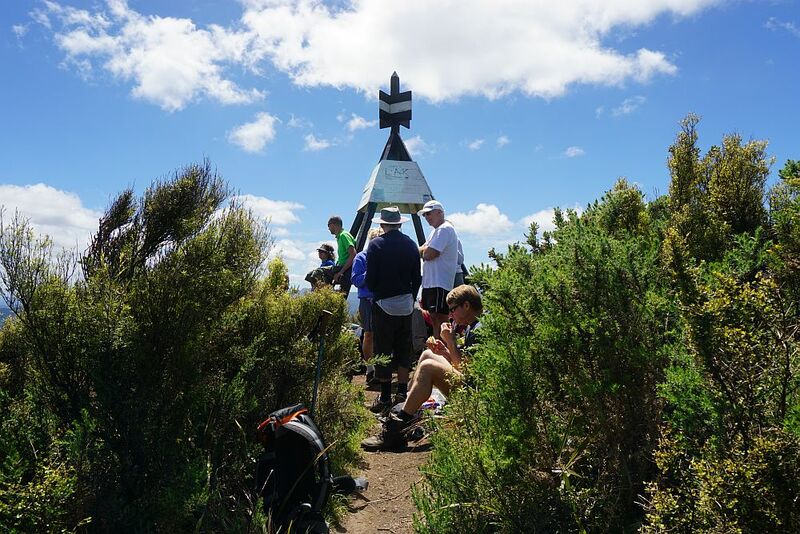 There are numerous other walks on this site which are not as challenging as Mt Karangahake, but still very satisfying to complete. Keep walking, and keep on enjoying it!